In my cemetery sojourns across Iowa last August, my uncle and I left at least one ancestral gravestone better than we found it. With years of natural debris having accumulated and hardened on the shared 1890s grave marker of Joseph and Elizabeth, I could still make out some writing on two sides of the obelisk-shaped stone. We could discover what it said, I insisted, if we gently nudged the debris away. Obliging me, my uncle took out some coins and we began. This entry was posted in Case, CLOUD OF WITNESSES ... COMMUNION OF SAINTS, IOWA (ALL), IOWA (Central), NEW ENGLAND - NEW YORK, Russell, UNITED KINGDOM and tagged Case, cemeteries, Duncombe, England, Iowa, Long Island, Rhode Island, Russell, Southold. Bookmark the permalink. Lovely post! It’s so neat that you were able to read the writing on the grave stone too. It appears we are cousins. My Great-grandfather was William Case Royalty. I have been to that little graveyard outside Charlotte IA just this summer. 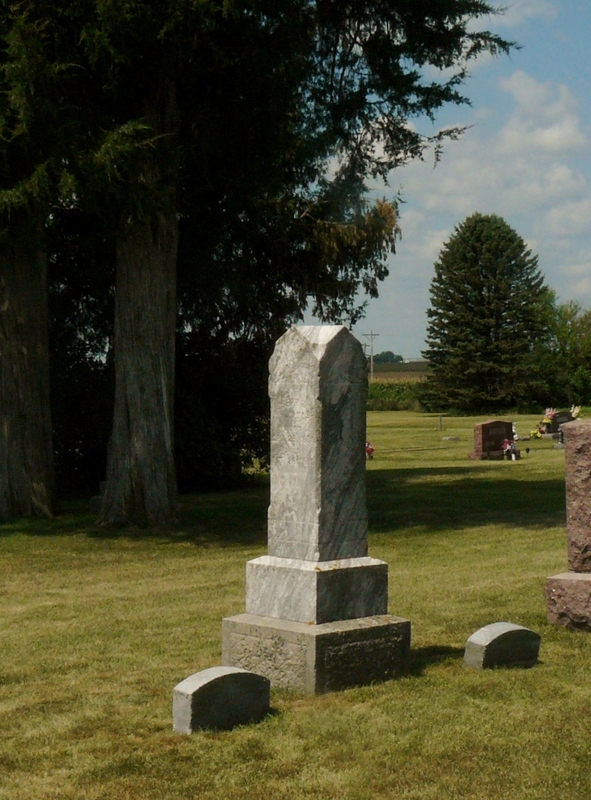 One great-great grandmother was Elizabeth Case, and another was Mary Case, both buried in Iowa. God bless. I was digging around in mthe further corner of my Ancestry family tree, followed down the path to your father. Sorry for your loss. My parents are both still alive at 91 and 94, living semi-independently with help close by. Thank you so much for your note and for your kind words regarding my father. I miss him. How lovely for you to have your parents living such long lives. It is nice to “meet” a cousin from the Royalty line, as it is one of the lines with which I am least familiar. I am trying to discern our common ancestor. My most recent male Royalty ancestor was Daniel Royalty, born in 1788. However, your ancestor’s middle name of Case makes me wonder if there is a common ancestor in that line. Contact me at dmnor10@yahoo.com. I have a group of researchers connected who descend from the Case and Hendrickson families.